The MCP3425 ADC can be used for various high accuracy analog-to-digital data conversion applications where ease of use, low power consumption and small footprint are major considerations.The MCP3425 is a single channel low-noise, high accuracy delta-sigma A/D converter with differential inputs and up to 16 bits of resolution in a small SOT-23-6 package. Please consider the MCP3421 version for resolutions up to 18 bits. The on-board precision 2.048V reference voltage enables a differential input range of ±2.048V. The device uses a two-wire I2C™ compatible interface and operates from a single power supply ranging from 2.7V to 5.5V. 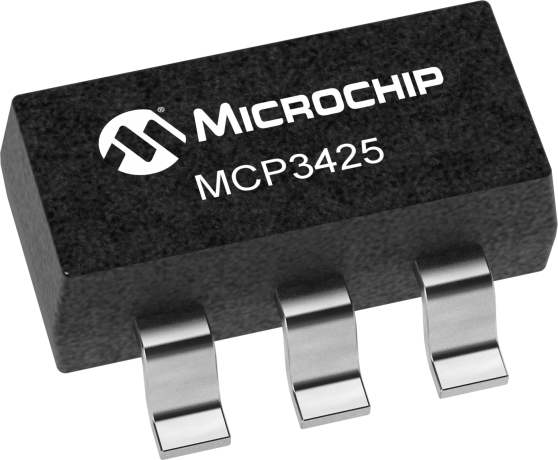 The MCP3425 ADC performs conversions at rates of 15, 60 or 240 samples per second with corresponding resolutions of 16, 14 and 12 bits. The onboard programmable gain amplifier (PGA) provides gain up to 8x. The device has two conversion modes: Continuous mode and One-Shot mode. In One-Shot mode, the device enters a low current standby mode automatically after a conversion, drastically reducing power use. The MCP3421 Battery Fuel Gauge Demo Board demonstrates how to measure the battery voltage and discharging current using the MCP3421.